How often to brush your pet? This Demat trimmer comb set includes 7" Demat Comb, 6.75" Mat Breaker and a Microfiber Fast-Dry Towel. 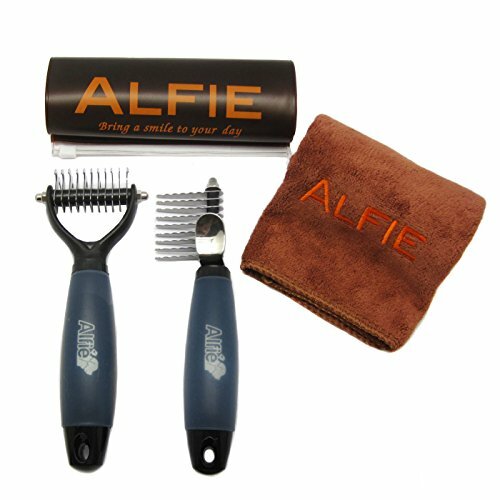 Product comes with Alfie Signature zip-lock storage bag for convenience and protection for years to come. The Mat Breaker gives a quickly and easily remove loose hair, mats and tangles with minimal cutting. Great for shaping, finishing, thinning and de-shedding. Be sure to brush your dog before bathing, as water can tighten any existing mats. Alfie Microfiber Fast-Dry Pet Drying Towel is made of a specially designed, ultra-tightly woven material, known for its excellent absorption and ultra-fast drying speed. Measures 28" x 18" - hand towel size. Absorb up to eight times its own weight in water, quickly allowing you to dry your pet much faster than traditional cotton towels. Gel grip handle for maximum control and extremely comfortable to work with. Keep your hand in a natural position to prevent fatigue and repetitive motion injury.